+ Two more new free fonts for you! Baybayin Modern Font (BMF) Sinta has exaggerated ascending & descending strokes and curls. This is influenced by some handwriting/calligraphy exercise I was doing recently. BMF Mono is monospaced; almost all the glyphs are fixed-width except for the O/U character which is half-width, same as space and comma. I initially thought that I released the BMF Mono when I released BMF Print. I apologize for procrastinating, I should've released this one a long time ago. Mono differs from Print in a couple of ways where Print is much more simplified, bolder, and has variable-width. "Alam mo, nung bata pa ako, ang tawag ko sa sulat natin ay Alibata? Alibata, alibata, alibata... parang pang bata. Ngayong matanda na ako, alam kong basahin, alam kong baybayin, alam ko ang sulat pilipino. Baybayin ang tawag dito. Baybayin natin ito." On your mark, get set, xo! The great baybayin kudlit race begins. Slit, slash, dot, dot, dit, dit, XOXO, LOL! It may sound funny to you but it's no laughing matter. Different styles of kudlit marks. Cross "Kudlit" - Ang kulit n'yo! Ever since the Spanish priest Fr. Francisco Lopez introduced the cross-shaped kudlit back in 1620 for the Ilocano printing of Doctrina Cristiana, we have been at odds with "reform". Whether it's truly a matter of principle, or protest, or stubbornness, the two camps of baybáyin practitioners (traditionalists and reformists) need to find a middle ground. While the first two reasons (principle & protest) are reasonable personal choice/preference, the stubborn ones are quite beyond reason. While some baybayin practitioners might say that the Spaniards (Lopez) "invented" the cross kudlit just to convert more natives into Christianity, that is hearsay (or should I say "heresy"? (sic, pun)). It is true though that the Doctrina Cristiana books were published to take advantage of the native people's literacy. However, the motivation for the friars to "reform" baybáyin script for legibility has its merit in modern typography. 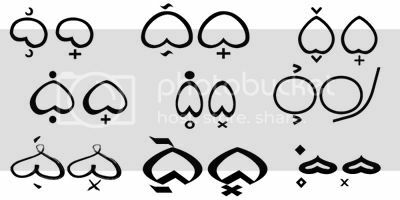 The decision to include a baybayin version of the virama (vowel cancellation mark) is not just a spur of the moment "invention" but it is more likely based on a careful study of linguistics by scholars (who happen to also be friars) at the time. 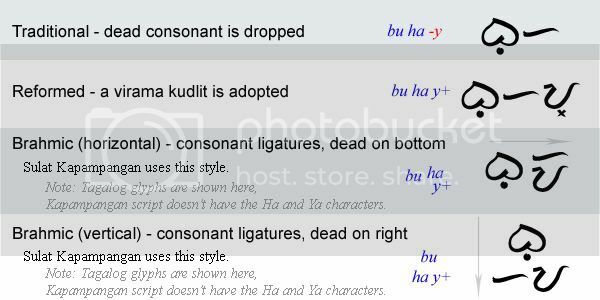 Other writing methods (Abugida) related to or predecessors of baybayin have vowel cancellation marks or systems, so adopting a similar system is not entirely unreasonable. 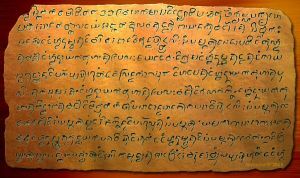 Note also that the kavi script in the Laguna Copperplate Inscriptions (LCI), which is dated back to 900CE, used both virama and ligatured glyphs to cancel vowel sounds similar to the methods of other Brahmic scripts and also what is currently being developed for the Súlat Kapampángan version of baybáyin. Correction on top image: Typo "you're" was supposed to be "you". When asked to read the sentence above, written in traditional "no dead consonants" method, the most common response was: "bayag mo'y maliit dahil sa utin ng itim na malaki", which means: "your balls are small (shrunk) because of (seeing) the black guy's big organ". Imagine the confusion at a duck farm in Pateros. Incited after a client ordered several breeding pairs of ducks and he received this note along with his bill? When all the poor farmer wanted to convey is, "bayad mo'y maliit dahil sa unti ng itik na malaki", meaning, "your bill is small because we are short on adult itik ducks". The farmer, just wanting to make up for the incomplete order by giving his client a discount, unwittingly conveyed the wrong message. Whatever your qualms are about the cross kudlit, for baybáyin to be useful in writing normal correspondence these days, the virama is a practical approach. Even the Mangyan "pamudpod" mark, introduced by Dutch anthropologist Antoon Postma, has been better received and is used by the Hanunóo. While the Kapampangan method of vowel cancellation is proving quite useful for both modern & traditional artistic design; although it has its limitations when it comes to modern typography (typing in a word processor and publication) and creating standardized fonts. For arts and crafts, tradition is fine. But for common use like signage and publishing, the virama is important. I say, learn to use both methods and teach both methods. Use whichever method is appropriate for the composition at hand. Crescents, and dashes, and dots, oh my! So many stylistic takes on the kudlit markers! I don't really mind at all, even I do them differently from time to time depending on the style of the characters I am creating or writing. The problem arises when artists and font designers develop or stylize separate marks for soft and hard vowels e/o and i/u respectively, where crescents are flipped, dashes angled differently, and dots become hollow and solid. I don't discourage the practice (I also do it), but I want people to think about ease of legibility especially when designing fonts. Named after the island of the Mangyans, from where I was born and where I grew up. This is a heavily stylized version of baybayin. The style is based on the Buhid's Sulat Mangyan but the characters are still based on the Tagalog/Ilocano form. I included an alternate Mangyan version of the virama (vowel cancelling kudlit) mark called a "pamudpod". It works the same way as the Spanish cross kudlit which is also still available. The pamudpod works aesthetically well at the end of a word while the cross particularly works well in the middle (and at the end) of a word. You can use either one or both or neither in your composition; your choice.